The Pines offers history of an era past - once the summer resort of the Scripps Howard newspaper family. 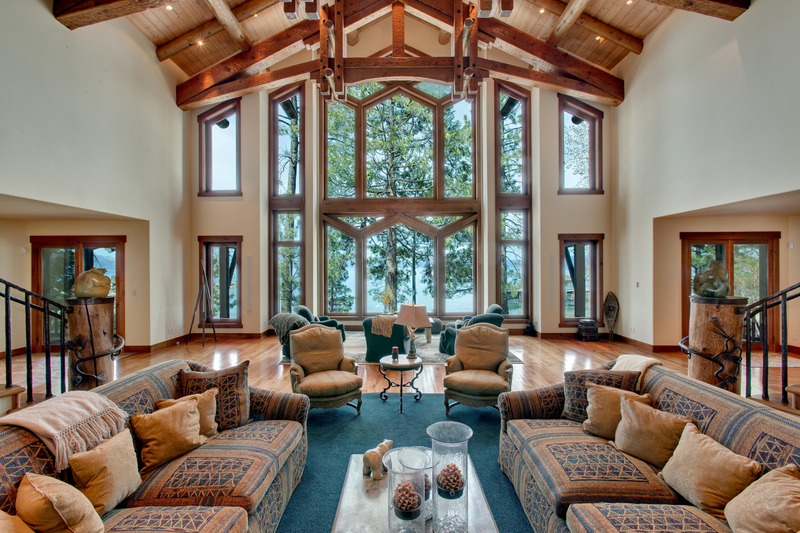 Today, the remarkable 13.60 acre estate is one of Lake Tahoe’s largest private landholdings. A rare find with approximately 400 feet of shoreline, the property consists of a main residence with 17 principal rooms, a guesthouse, a caretaker’s cottage, shop and outbuildings. The grounds encompass a three-hole golf course with room for expansion, a swimming pool, beach, pier and boathouse. Ponds, waterfalls and lush landscape accentuate the gently sloping and level grounds studded with old growth Ponderosa Pines. Centrally located on Tahoe’s east shore, The Pines takes advantage of everything Lake Tahoe has to offer. In addition the seller indicated that the golf course is a Par 3. The shortest hole is 130 yards and there is potential for another three holes ranging from 130 to 350 yards. Lake Tahoe is America’s all-year playground with something to do for everyone; hiking, boating, skiing, golf, tennis, and world-class entertainment. Nevada offers a favorable tax structure. There is no personal or corporate income tax, no inheritance tax, and very low property taxes. The Pines – Rich in history. Rich in rewards.